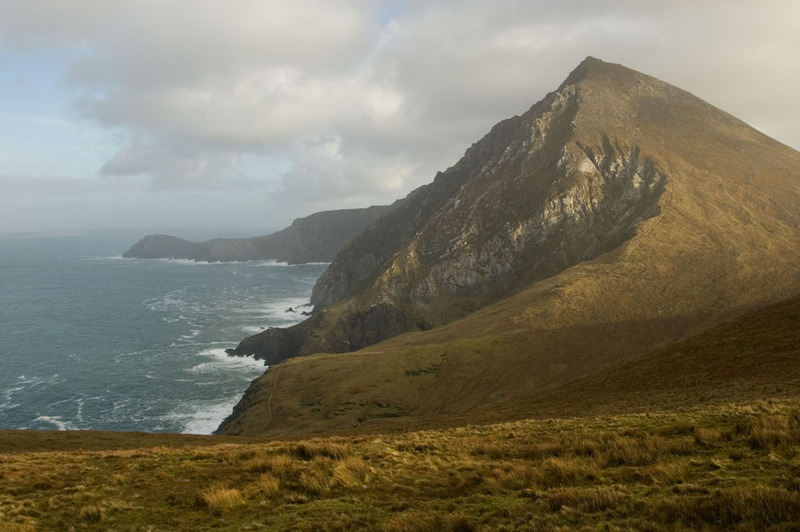 Brent: While artist-in-residence in the most western point of Ireland, Achill Island, you tapped in a description of the landscape: Dramatic, With Cliffs, An Ocean, And Totally Isolated. This is your work: my first impression. There is Nature in your pieces. And it took a tough wind and a heavy sea to set this all in motion. Cecilia: I am glad you brought up the residency in Ireland. 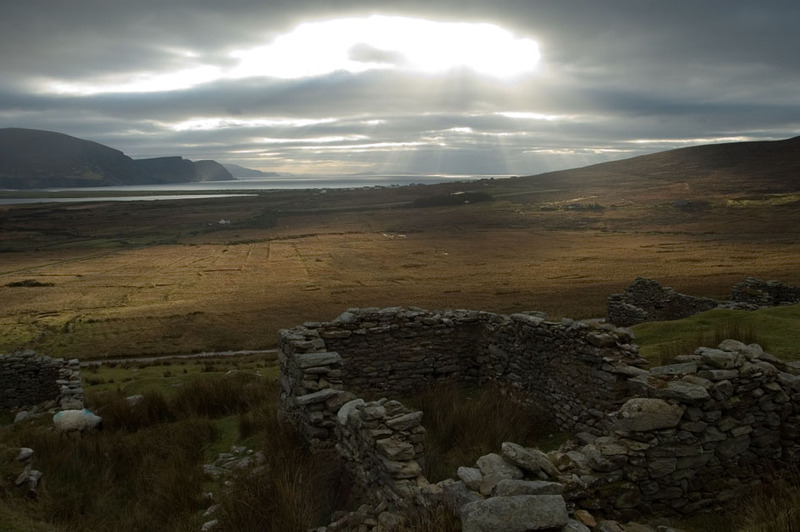 The Achill Heinrich Boll Foundation operates the residency and it is a great opportunity to explore this particularly isolated peninsula. As noted, Achill represents the most western point of Ireland. It signifies the ‘extreme edge’ of the land. You cannot physically go further. I would walk over the high cliffs and see the ocean there below, and could do so without distractions: There were only the sea and the waves, the wind and the lines. 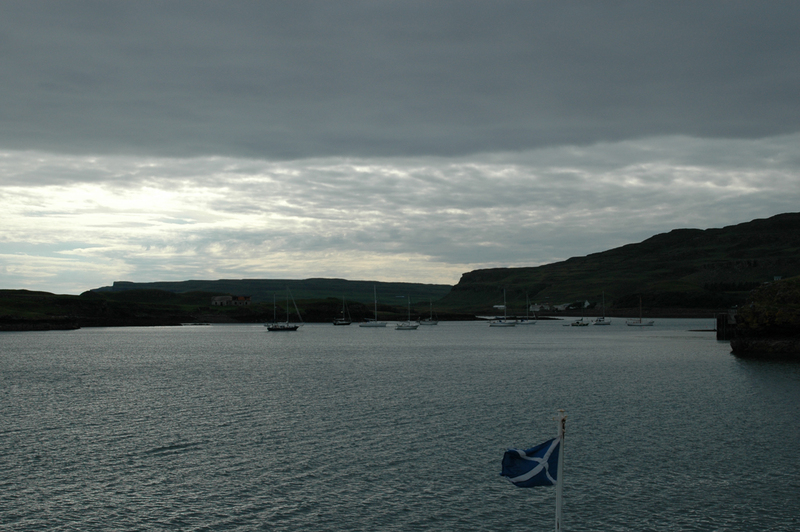 In 2008 I visited Canna, a similar island. Canna is part of The Hebrides, located off of the western coast of Scotland. Only 15 people live there. And it is filled with nothing: There are no roads – traffic, shops, or computer. The only payphone you could find was in the little white cottage from which you could view the sea from every window. These are the places that impress me most. They allow a focus on the rhythm of the landscape. And this gives me time to find the repetition. The tougher the wind, the higher the wave, the more I like it. In front of a work you are likely to focus on color, line and form. Maybe there is a sense of weight. I want to transfer this sense to the viewer. It’s kind of an abstract value until you actually lift the work. The sculptures are flat and executed in thick (8-15mm) plates of metal. While they appear light (like graphic signs or forms), they are actually very heavy. The challenging features of the material are the power and strength of the metal. This is what I like to work with. I use the saw-cuts to interfere/delineate the square form or circle. The placing/location of the cut is crucial and is a very clear and radical decision: once performed in steel it is irreversible. If it is 1 or 2mm to the left or right the whole work can change, shift. The balance and composition has to be just right. I admire the work of Ad Dekkers (NL) and Gordon Matta Clark (US), construction and de-construction are important features of both their work, however they interpret it. Brent: Did you work through other materials before you came to metal or have you primarily focused there? Cecilia: I finished the Academy for Art and Design in Den Bosch (NL), specializing in sculpture. Back then there was a very strict division between the disciplines; painting, sculpture, graphic design, etc. It seemed as if we all came from different planets! From the very beginning I had a fascination with metal, the welding, the cutting, the strength of the material, along with the sharp edges. When I have an idea I can see it in metal. It’s there. I don’t see clay, wood, plastic, or any other material; it is just there – in metal. My dreams… they come, and they are with this material. On rare occasions they do arrive in color. But it’s one color. Once I left the Academy I got a chance to rent an old forge. This became my first studio, a very dark and cold place with horseshoes hanging on rusty nails on the beams. The blacksmith taught me how to use the fire, to understand the glowing coals, along with the practical side of metalworking. 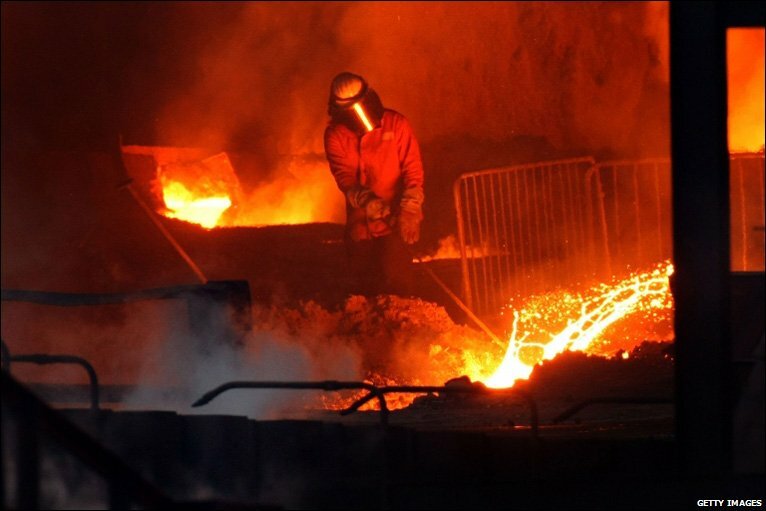 When I first saw the intense orange glow of the molten metal I couldn’t take my eyes off of it. It was beautiful, fascinating, and dangerous. I thought whether this could be alchemy: at the very least it certainly is about transferring energy. Cecilia: Carrying-over ideas and thoughts. For me to materialize an idea or a concept, which can also be thought of as a conversation, similar to what we are doing here is about communication. We write our thoughts down. Eventually they become more concrete, more real, and one person’s ideas glide over to the other. The same may happen in the other direction. This becomes concrete, real, and something that breathes life. To bring this idea back to ‘Gaoth’ – while still considering the word or the idea of ‘evaporation’ – the thing I was actually after in this work was to catch the wind, to bring out the movement. Impossible? Oh! Perhaps not! In a sense, to attempt to materialize this elusive thing is what I am aiming for: this chasing dreams and catching butterflies. The longer I work with metal the more I get to know its character, its resistance, obstinacy and strength. The metal definitely has its own plan/idea. At the same time I have my idea. So it is a matter of going along, getting along, this happening with greater consistency, while this process of giving-and-taking still challenges the relationship. Brent: And your earlier work? 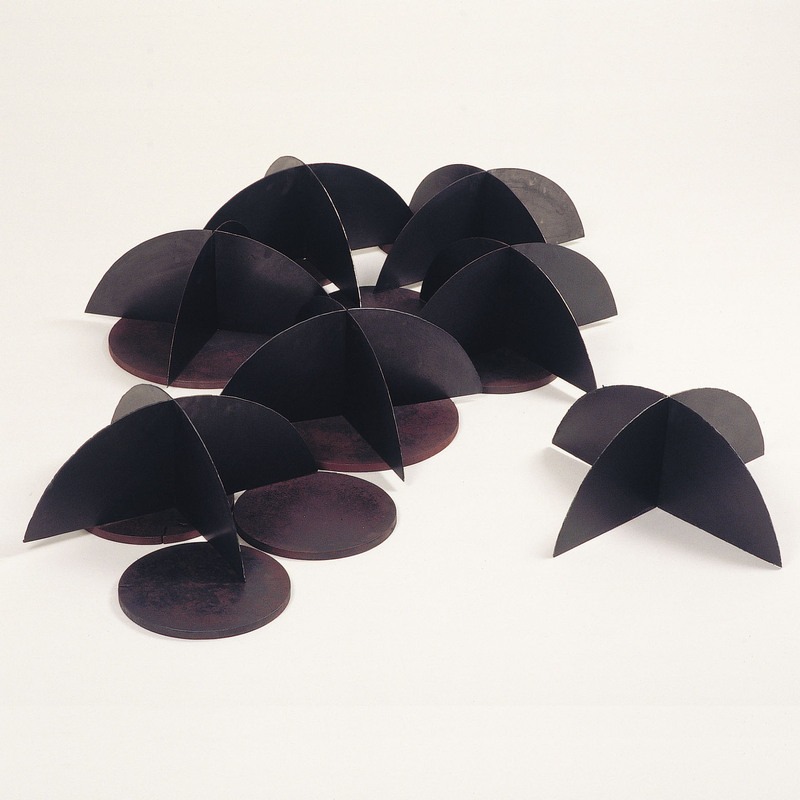 Cecilia: When you look at the earlier work you can get that I am a sculptor dealing with formal aspects like; balance, weight, measurement, scale and of course the material. 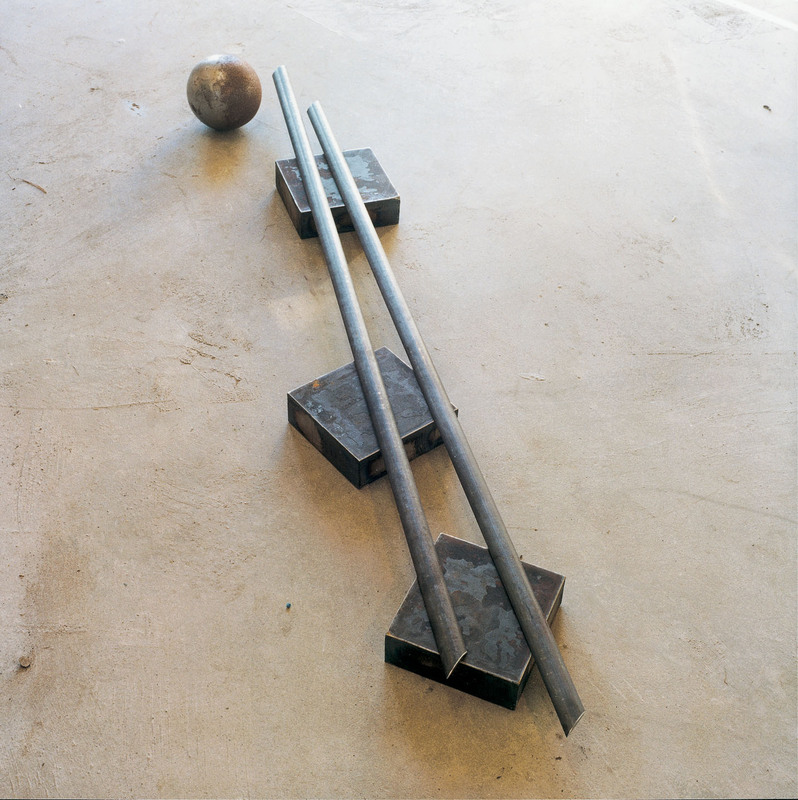 I made a lot of floor-sculptures using iron balls and bars. I would play with the material, look for composition; there was a kind of building and construction thing going on: ‘Meccano’ or ‘Lego’ come to mind. In recent years I feel my work has changed, it has become clearer, straightforward, and less complicated. When I use constructive methods I don’t want them to be visible. This is something I’m very conscious of from the beginning, I try to keep things simple or at least make them look simple. Cecilia: There are some minimal changes; at present my work is more object than sculpture, mainly wall based but it still is three-dimensional. I think everything comes in a third dimension, I don’t know about flatness, to me there’s always a minimal slope, a beginning and an end. I also feel that the placing of the objects in a space is crucial, it has become increasingly important to extend the lines, to draw visual lines from one object to another, and another… I like the use of repetitive forms and patterns, a way to emphasize the onward motion in space and time. I respond to the plate, whether this is steel or aluminum, and the focus then is on the cut and the new shape that it forms. The metal needs to sit on the wall and as it’s pretty heavy th ere needs to be proper suspension points (certainly you would not want one of these plates coming down on your toe.) I use milled cubes of aluminum that are custom-made, which suspend the plate of steel exactly 10mm out from the wall. Here sculptural principles such as scale and balance, composition and symmetry come into play. This is the start. And literally what moves is a physical response to the earth being under my feet, the steel, and its weight. Brent: With ‘Needles and Pins‘, which is a pair of vertical rectangular plates, the sides each have a pair of cuts that appear identical on both plates. The patina suggests a landscape, a mountain… could it be Mount Fuji? With the left plate there is a sense of foreground. The base on each is heavier, so the read is very solid. The cuts pull down, perhaps under the pressure of gravity. The curves suggest this. Despite the very solid and weighty feel the shadowy landscape offers an escape – lightness emanates from the tectonic. With the internal space between the two plates, the cuts no longer appear to bend down from the pressure. Instead as a reverse image the center pushes against gravity, like a force, surging. And your titles, where do they come from? Cecilia: Well, whilst working I heard this easygoing song from the seventies by ‘Smokie’ titled ‘Needles and Pins’, it is so uncomplicated and smooth, therefore I love it. Other titles refer to landscapes, oceans, forests and the wind. These titles remind me of special places and experiences. By using them I know exactly when they were made and why. ‘Needles and Pins’, the perception of a landscape – my back garden. I woke up and saw the wooden frame of my window and the two dark high pines in the garden, the massive strong volume of the trees and the shimmering light shining through the branches. There were darker and lighter parts in this panorama; also sharp edges like saw cuts. I could only see part of the high pines; in my imagination they were so high in the sky, never-ending: apparently immovable, but increscent. On closer observation I only see a fragment, a dark volume that is completely abstract. Throughout the years I have made lots of drawings of trees trying to understand their form and volume. 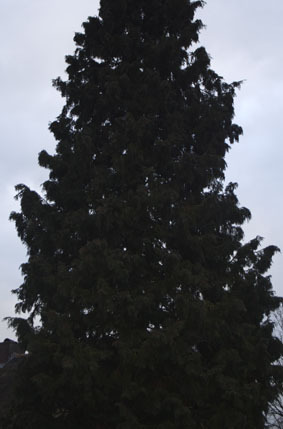 The sight of this tree is just a feature or trigger that arouses action towards my studio. For me the observation of a landscape often brings out new ideas and clears the mind. It’s not about representation, if it were I’d take pictures. Needles and pins is my first vertically oriented work, it measures 70 x 44cm, and this upright position is so different from the horizontal works, as if the whole world turns. I found a ‘building aspect’ in this positioning, which opens up new possibilities in the vertical direction. Maybe the patina suggests a landscape or a mountain: there is a solid darker base and there are lighter parts. I use the change of color to intensify the form, lighten it, to make it look less heavy. There is a rise and fall and shades of color – I want to extend the lines from one piece to the other. You mentioned ‘surging’, that’s the right word because it implies a movement like the tides of the sea. In ‘Needles and Pins’ and ‘Blacksod Bay’ the patina stretches over the two parts of the work, from the left side to the right side. To answer your question: ‘Could it be Mount Fuji?’ I honestly don’t know, I sure like the idea and would love to see this mountain some day. You have seen Mount Fuji, and it must be fascinating. Pity we don’t have Dutch mountains! Now that we’re talking about Mount Fuji I’d like to mention Hokusai, (1829-1832) who created thirty-six views of Mount Fuji. He was focused on landscapes and had this wonderful personal obsession with Mount Fuji, making 36 woodblock-prints of it in differing seasons and weather conditions from a variety of vantage points, different places and distances. I think art is very much about obsessions and perseverance. Brent: The mountain expresses a record of time and timelessness. The surface of the metal plate has become increasingly important for you; the metal accentuating time and age, while the bright orange anodized aluminum is very much signaling the ‘now’. Cecilia: Yes, the plates have a ‘patina’, each one very unique, and the color of the plates vary dramatically with sometimes more blue at the edges, more gray in the center of a sheet, in fact, it is just like a fabric with a special structure, the pattern. I use chemicals to intensify the colors and patterns sometimes using gunblue to retouch or cover up the scratches on the surface of the metal. When working with aluminum the surface treatment is very different, it is a factory finish, the aluminum works have been anodized: this to obtain a specific color and protect the aluminum from corrosion. The process is hard to control and sometimes this really worries me, not knowing what the result is going to be this time… for me it is important to maintain the radiation of the aluminum, the color is in the material and not on the material like paint. Up till now I only use the color orange because of its overpowering quality, it is a very direct color that immediately increases energy levels. Whereas the black can be so deep and absorbing like a sponge. There is this searching for balance and equilibrium between the form, the color and the finish of the material. The preference is for purity, and simplicity: the tension arising between the form, color and the finish of the material. It needs to be perfect. And fortunately I found some technical engineers who take the challenge to make something ‘on the edge’ and divert from mass production. 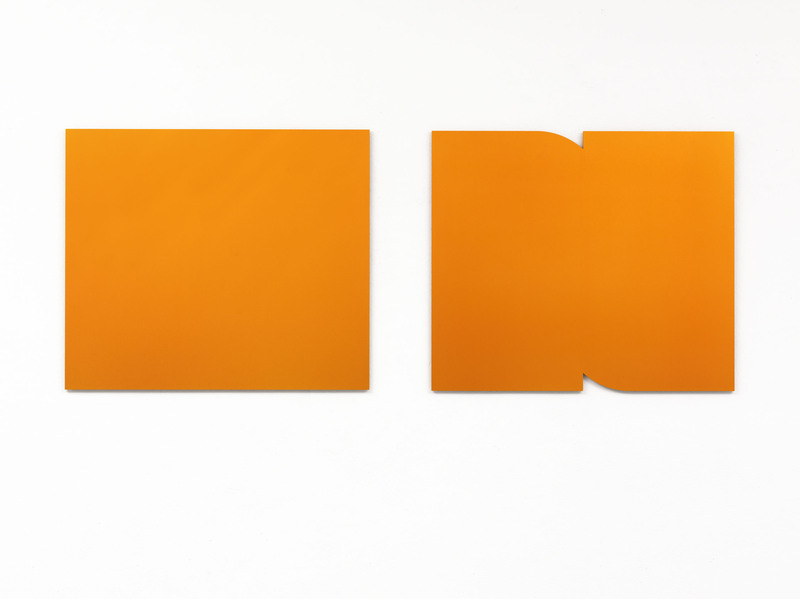 Right now I am working on ‘Orange Tide III’, making two equal pieces and want to hang them side by side in the show ‘Formeel’ at the Waterland Museum in Purmerend. The forms have already been cut but the anodizing is so complicated… it is almost impossible to obtain this smooth orange surface, I don’t know… I might have to start all over again. During my residency in Ireland I definitely wanted to visit Clare Island, a small island just beneath Achill Island. It was hard to get a ferry because it was out of season, nobody went there this time of the year. Only the doctor’s service would go once a week to visit patients, taking the life rescue service boat. I was welcome to go with them. The name of the boat ’very likely’, which is a nice name for both a boat and a new work, is suggestive of expectations and possibilities. 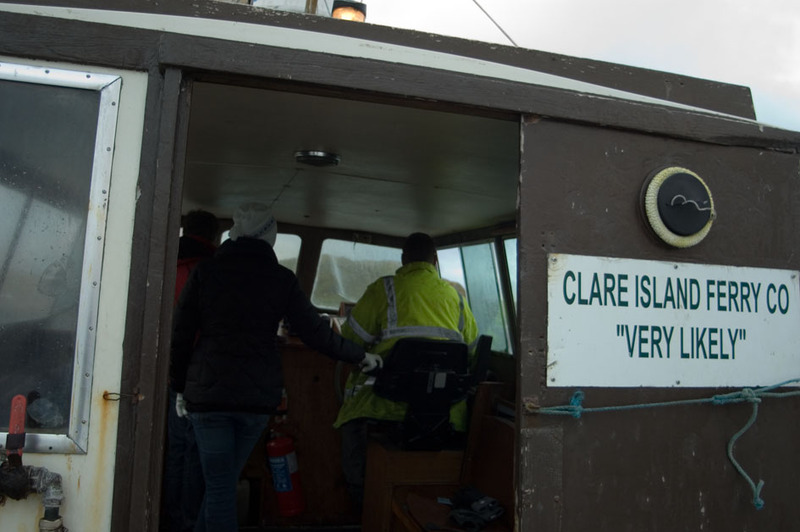 In referring to this journey to Clare Island, it is likely but not certain that dreams and expectations can become reality. At the moment I am working on ‘Blacksod Bay’; a work inspired by a bay in County Mayo that opens to the Atlantic Ocean on the south. The bay is 16km long and 8km wide at its mouth, and is a safe place for anchorage. The color of the Atlantic was a very deep gray, with bluish undertones. I was very happy to find an appropriate plate of steel with this intense gray/bluish surface. When starting a work I begin by making a huge amount of sketches based on a rectangle, then I cut the molds out of thick cardboard on a scale 1:1 and hang them on my studio wall for several weeks, sometimes doing a little shift, changing the curve a little bit or replacing the saw-cut a few millimeters. There has to be a natural tension in the lines and forms, it is not a mathematical thing. I look for a certain flow in the lines and a directness in form. Many molds end up in the wastebasket, only a few pass through. ‘Blacksod Bay’ consists of 2 equal parts, each part measures 95 x 9 3 x 0.8 cm, again it is a set of two and obviously there is a lot of similarity with ‘Needles and Pins’, this work also is upright and the patina is very unique, also I like the white wall to be part of the work. 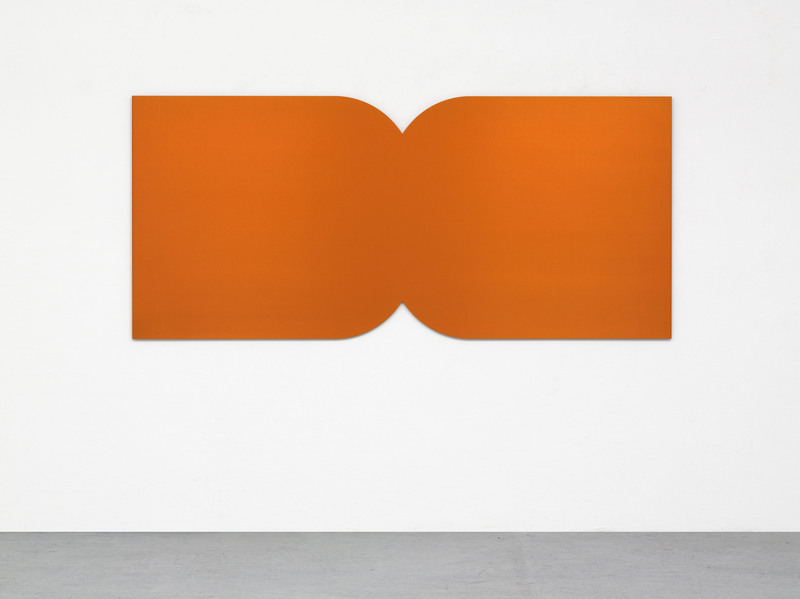 I like the ‘nothingness’; maybe the space in between is the most interesting part of the work? The representation of things difficult to detect or grasp by the mind, the subconscious… yes, the intuitive part is present in my work and me, some things remain indefinite, they just happen because… and despite of all theories and science. Focused meditation is an interesting way to clear the mind and find new ways and directions, when we started the conversation I asked you about ‘the act of raking the gravel’ in the Japanese stone gardens, remember? I have a great interest in this kind of Zen; I admire the intense concentration and the focus of the monks. Brent: I remember… I also remember saying that you didn’t necessarily need to go to Kyoto to see that mood and air, in fact it is here in Tokyo, and can be anywhere. It seems to be about how one touches things in a mental way, which then affects the touching physically. Children are generally taught to respect objects just as much as they do living things, carrying through. This makes the waves… whether it be seen on the busy streets of Tokyo, or within the tranquil history nests of Kyoto. The wind you find in these different locations might be coming from different directions, but it is still the wind? Cecilia: The wind makes the waves. Yes, it definitely is about the transformation of energy and the force of nature, without wind there will be no waves thus no movement and no progression. 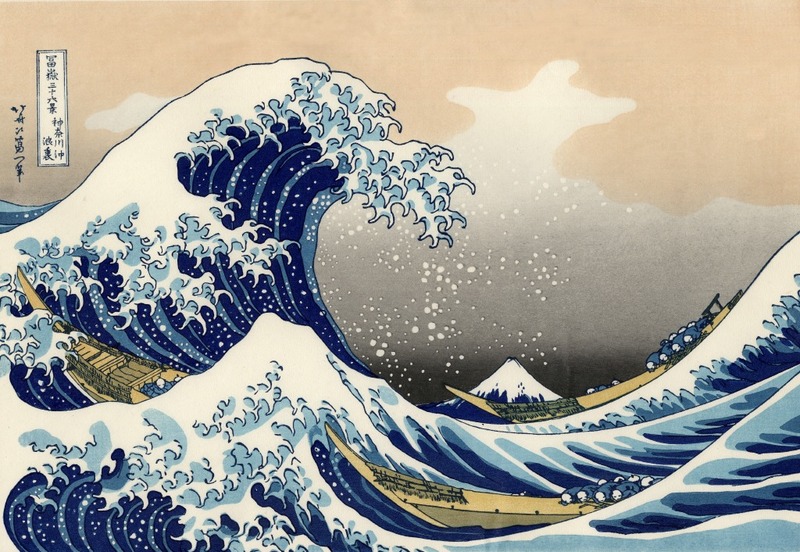 In this context I would like to refer to the ‘Great Wave’ (1829-1832) of Hokusai. Interestingly he made several Great Waves, there is a ‘pre-great wave’ and a ‘post-great wave’, all about man versus nature. Hokusai is so right; we need a lifetime and even more to reach a stage of ‘understanding’. From around the age of six, I had the habit of sketching from life. I became an artist, and from fifty on began producing works that won some reputation, but nothing I did before the age of seventy was worthy of attention. At seventy-three, I began to grasp the structures of birds and beasts, insects and fish, and of the way plants grow. If I go on trying, I will surely understand them still better by the time I am eighty-six, so that by ninety I will have penetrated to their essential nature. At one hundred, I may well have a positively divine understanding of them; while at one hundred and thirty, forty, or more I will have reached the stage where every dot and every stroke I paint will be alive. May Heaven, that grants long life, give me the chance to prove that this is no lie. Brent: To keep with the practical – recently we have been emailing back and forth regarding the anodizing of the aluminum pieces, also about the small multiples that have been in process, pieces that will be set in a box. Firstly I need to say how much I admire these small multiples but the anodizing has recently given you trouble. Could you talk about that? Also when we go back to the metal pieces each with their distinctive patina, the anodized pieces are very different, the color needs to have an even flow. Why the demand for the difference? Cecilia: Oh yes, always looking for an equilibrance between the concept, idea and the technical implementation. Working on the edge of technical possibilities and impossibilities you have to take the risk sometimes hoping for a favorable outcome. I am glad to hear you admire the multiples. And yes, there was trouble producing these works. They all went wrong: a domino effect. The metal supplier brought the wrong alloy of aluminum – I know that now. I had it cut into shape, did the tapping and drilling, and it looked great. Thereafter I brought the work to the anodizing company… Brent, do you really want to know more about the technical problems considering anodizing? Cecilia: I have my works color-anodized, orange, and there’s only one company that can manage these sizes of work in this specific color. Here we are talking large-scale. Though to start I had some small pieces anodized. The surface came out with all kinds of stripes and spots. The anodizing company said it was the result of the quality of the aluminum while the steel-company said it is the anodizing. Of course each blamed the other. Meantime I consulted some technical engineers and learned about all the different alloys of aluminum and their applications. The metal supplier partly compensated for the expenses and I had to start all over again… Orange Tide III is now ready finally – it is very smooth and very orange. As you notice there’s a difference between the colored pieces and the more ‘rough’ metal pieces: the even versus the rough, the perfection versus the imperfection, etc. In the first paragraph of our conversation you said: ‘there’s nature in your pieces’, and yes, the landscape obviously is my main resource: sometimes I like the rough and the unspoilt landscape, other times I love the industrial landscape. I think this leads directly to the surface treatment and the finishing of the metal plates. The purity of the metal plates have their very own beauty, each piece is unique and has its very own quality. In contrast the anodized works go through several processes to obtain their specific color and I prefer to make these works in series. 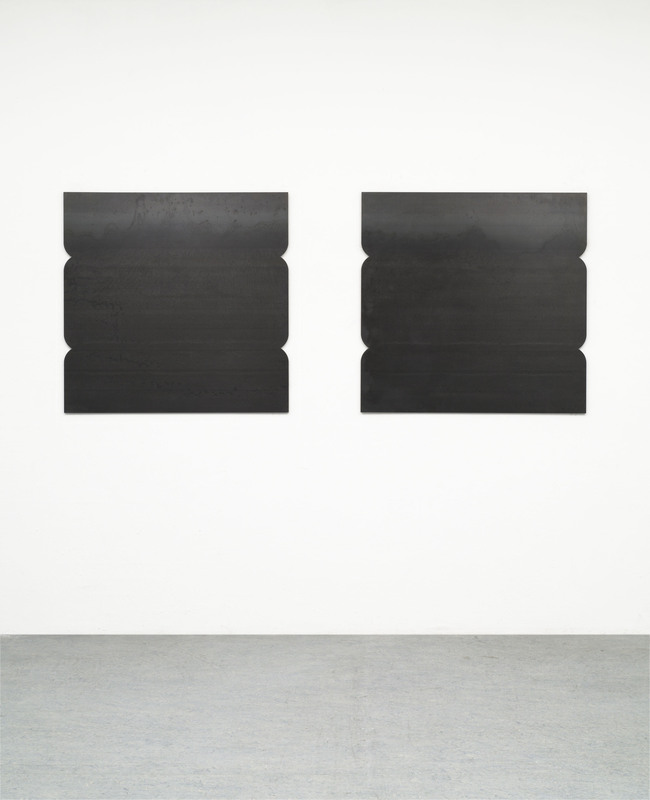 The use and presentation of industrial and plainspoken materials is very much related to minimal art, which I highly admire especially for its directness and force: no need for bells and whistles. It’s certainly the pureness and directness that I’m looking for. For me ‘extreme abstraction’ is a way to separate the fibers and threads of life. Just a simple intervention or a minor shift can cause a change of view. Like the wind slightly changing direction or blowing a bit harder, things change… first one wave, then another, and then… the whole ocean is in motion. 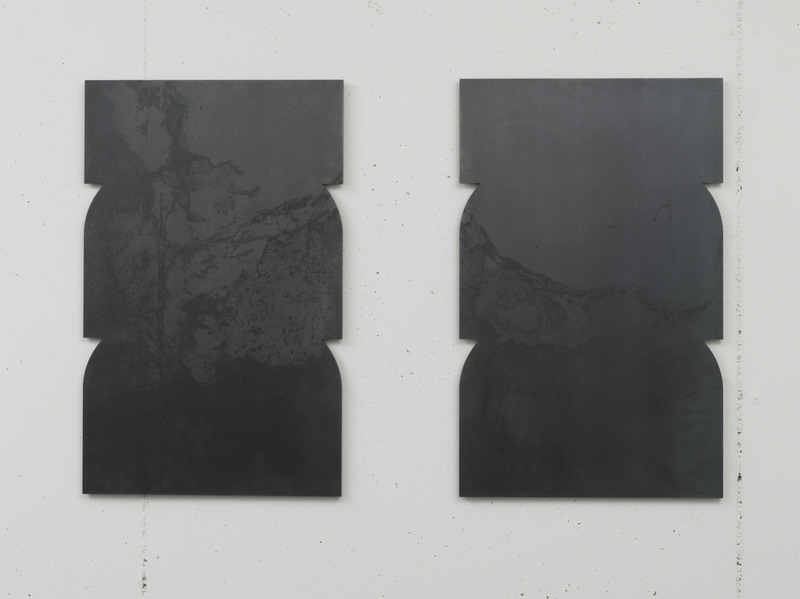 Tags: Aluminium, Cecilia Vissers, Minimal, Reductive, Sculpture, Steel. Bookmark the permalink. What a wonderful piece! Cecilia, it’s great to learn more about your thoughts and process. You know I love your work. Brent, you’re a wiz with these interviews. Not many have the keenness of wit and the sensitivity to draw out of a visual artist their thoughts and the narrative behind their process. Congratulations! It’s actually not the wind that makes the waves. Waves exist because of the combined effects on water of the gravitational forces exerted by the moon, sun and the rotation of the earth. I really enjoyed this. It’s great to hear about your materials and the hurdles that can occur when making art. Your thoughts are beautiful as is your work. Thank you to Brent and Cecilia! What a wonderful story, forged through the meticulous eye you’re both bringing to the work–the curves of the land, the waves, the cuts in the metal–and even the curvature of the wind. Fabulous interview, Brent & Cecilia – fabulous work. Both combine to go to the heart of the matter and the matter of the heart. Nice work both of you. Thank you Brent. As usual, I am always amazed at how you go beyond the visual and find the essence of the work. Wonderful work Cecilia. Just so nice to see you bring this about with Cecilia, her powerful work — thanks for another good moment ! Again, as you know Cecilia I think your work is powerfully beautiful. Rigorous and sensitive at the same time. They guy who said that waves are not created by wind is obviously not a surfer. Surfers know there are two types of swell which hit the beaches: Wind swells which are short and choppy, and ground swells which are solid and consistent and formed by areas of low pressure air out at sea. Gravitational forces affect the tides – not the waves. Thanks a lot, Richard, Connie, Marcus, Louise, Jessica, Tony, Karen, Patricia, Kate. Your comments are very valuable to me! Minimalismic – Architecture. Interior. Art.